INFO: CNO, VJCS; CSA; SMA, CSAF; CMC, CINCEUR-SACEUR; USEUCOM, CINCPAC; CINCPACFLT, CINCLANT, CINCLANTFLT; COMSUBPAC, COMSUBLANT, CINCCENT, CDR-JCSE, CGSOUTHCOM, CGFORSCOM, CGNORTHCOM, CG ALASKAN COMMAND; Senator Allen, and Congressmen Goode and Cantor. Ref Ltr was sent to you and fourteen Flag Officers, including nine Members of Congress, conclusively proving that the Soviets now have “spoofing” capabilities which can defeat our best radar technology. The following will inform you of our coming naval defeat as a result of this “pilfered” capability. Moreover, you can thank Bill and Hillary Clinton for the spoofing technology transfer in 1993-1994. The ref Ltr also details how this transpired; and can be found on page 129-130 of the book, “America Sold Out“, published in 2003. General, I have a friend who, during the nine years I have known him, has never been wrong on any “prediction” he has made. This includes, but is not at all limited to, the Dow-Jones Industrial’s “bottom-out” on 24 Sept 2002; and the rise of “per-barrel” oil prices, to the very dollar amount(s) this year! The subject prediction, detailed below, concerns the US Navy. 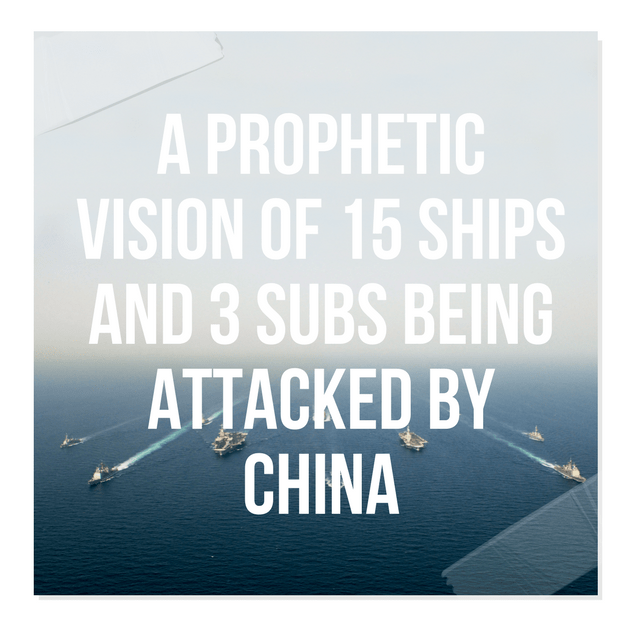 Some days ago my friend was given a Holy Ghost vision of a US Navy Carrier Task Force, consisting of fifteen ships and three subs, being attacked by Chinese (PRC) forces. At that point the entire formation was struck by missiles, each ship being hit; including “two [SSN] submarines“, which were operating submerged on the flanks of the CVA. This included the loss of a “rover”, fast attack sub, which was also in the Task Force. Subsequently, enemy aircraft over flew the fleet; therefore it must be ascertained the attacking planes were never detected by the radar screen. The ships were sunk by “air-to-surface” missiles, whereas the subs were sunk with “air-to-subsurface” devices. I suspect the missile which hit CVA had a “nuke tip”. I also suspect the recent Sino-Soviet exercises were perfecting their operations plan(s) to attack our WESTPAC units. Be advised the “bait” will be an incident with Taiwan; and the Russians and the North Koreans shall be, in some manner, involved in the scenario. The entire formation was sunk; not one element/unit surviving. The loss of life was great. Be advised, the gentleman having this vision has absolutely no knowledge of US Navy surface or subsurface operations/tactics; to include convoy screening techniques. Have a great day, sir, as you and the other “Chiefs” are going to need a bunch of them — soon. P.S. The expected destruction of Florida by apocalyptic cyclones has also been prophesied by the same man; and confirmed by several others. Be advised that Hebrew University professors, using the HBC, predicted all 39 Scud missile strikes on Jerusalem in the Gulf War; thus, only one person died [of a heart attack] because he was too stubborn to evacuate his apartment, as IDF-ordered. I also know by prophetic revelation that New World Order operatives shall strike a major US landmark; and deduced logic says the “militia” may be blamed so a UN-cops-run “gun collection” scenario can begin. Capital Warship-B Large warship, type not known by the observer. Capital Warship-C Warship, type not known by the observer. WEAPONS WILL BE “SURGICAL” SWIFT, ACCURATE AND DEADLY IN NATURE. NOTE: SHIP DESCRIPTION IS AS ACCURATE AS IS POSSIBLE FROM A “NON-NAVAL OBSERVER”. ACTUAL TYPES OF SHIPS CANNOT BE VERIFIED BUT DEPLOYMENT, AS DEPICTED, OF THE VESSELS AND SUBS WILL BE THE ACTUAL FORMATION AT THE TIME OF THE ATTACK. THE CURRENT GLOBAL “BALANCE OF POWER” WILL SHIFT AS A RESULT OF THIS ACTION. “The Navy’s reaction is telling, because it essentially equals a radical change in direction based on information that has created a panic inside the bubble. For a major military service to panic due to a new weapon system, clearly a mission kill weapon system, either suggests the threat is legitimate or the leadership of the Navy is legitimately unqualified. There really aren’t many gray spaces in evaluating the reaction by the Navy…the data tends to support the legitimacy of the threat”.